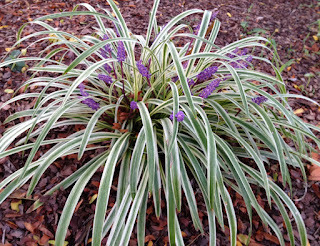 I was delighted to see that the lilyturf, also known as monkey grass, which is really Liriope muscari 'Variegata', is blooming now. This tough as nails plant survived the Drought of '12, partial shade, neglect, squirrels and did I mention virtually no rain for three months? Well, I don't know what family I'd declare it to be in because I can't find mention of it in that textbook, Vascular Plant Families by James Payne Smith, Jr. (Mad River Press, 1977). I would have guessed Liliaceae and hoped for partial credit. The correct answer for which plant family Liriope is in is Asparagaceae, in particular the subfamily Nolinoideae. But partial credit could have also been given for the plant family Ruscaceae, which at one time stood on its own before they moved it and several other families into the subfamily Nolinoideae of the family Asparagaceae. It took me awhile to sort that out even after I read it online. You will not be quizzed, so let's move on. The primary genus in this subfamily is Nolina. I've never heard of Nolina, which lead me to look that up, too. Turns out that most of these plants are tropical which is why I'm not familiar with them. I'm a temperate gardener, and I mean that in both the climatic and personal sense, being a mild person, such as I am. I am! I suppose we are just lucky at this point that the plant taxonomists didn't change the genus name, Liriope. Otherwise, we gardeners wouldn't go around wondering if we were pronouncing it correctly. Li-RYE-o-pee? Sure, however you say it is fine, just say it really loud and no one will have the nerve to correct you. They'll just assume that if that isn't how they pronounce it, they are wrong because you said it loudly and proudly. Isn't that how all arguments are won these days? The louder person wins. The other, more temperate person gives up and goes back to diving down rabbit holes of botanical plant families, wondering just how long she should keep a plant taxonomy textbook published in 1977, which isn't correct anymore? Keep an eye on your liriope, it has, over time gone wild at my place and will not behave. Anonymous... I find that is true of Liriope spicata, which spreads. L. muscari grows in a clump. Exactly right on all counts, Carol! The loud and the great asset that Liriope is in the garden. I was just thinking how the variegated one should be spread about here more. It is especially pretty with the purple flowers and black berries that will come later. It does not spread at all unless the gardener digs it up and divides it, which I need to do. The more temperate person is just a person with better manners. Love liriope. Very durable and very pretty. I saw that growing in the grocery store parking median just yesterday. It made me wonder if it would be hardy for me. I believe this grocery store is at least a zone warmer than me, but my winters are not what they used to be, either. This requires more investigation! A favorite plant in my landscape. It was here when I moved into the house in the 1980's.Tough as nails are really pretty. A great plant for the front of the border or a large mass. I have 70 of them and they too survived the big drought. Thanks for the plant info! Until this summer, when I took a class on groundcovers, I always pronounced it leer-e-OPE. Not one of my personal favorites but it does the job. I don't care as much for the normal liriope, but I absolutely love the variegated one. It gets absolutely no care from me but still looks great. It hasn't spread at all for me. 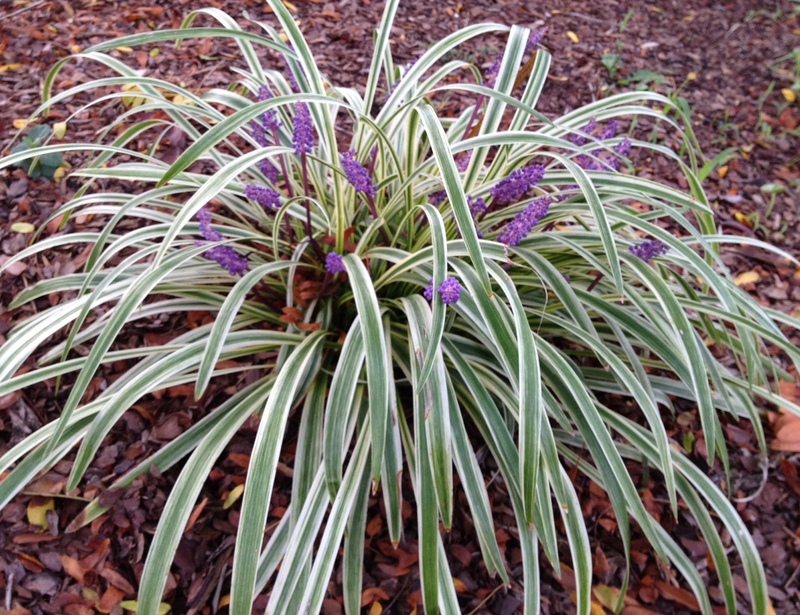 I've recently seen the variegated Liriope spicata 'Silver Dragon' at the nursery, which is so pretty. I wonder if that would be more of a spreader. Just passed up 3 plants of this wonderful plant yesterday because I am a zone colder than it tolerates. Boo-hoo!